One time there was a heavenly place where elderly people told tales from oriental nights masked with the mystery of fabulous distant and imaginary lands filled with palaces of gold and emeralds with thousands of rooms, where echoed the smiles and whispers of perfumed dancers that whirled around covered in silky veils and had the ability to immobilize one with their striking gaze. They danced and danced in eternal crazy happiness under the notes of lutes and dayerehs and the magic of their world was tangled in knots by the nostalgic hands of those who wanted to remember it until the end of time. Now, all those tales, stories and mystic worlds stand fused in Persian carpets and if you lay in one of them and fall asleep, you are going to dream of oriental nights. Now that you had a taste of the oriental world let’s come back to reality and find a way how to put some mystic air flow within the walls of your house. When people hear or read the word “Persian” different thoughts can cross their mind. Historians can think about the Persian Empire and civilization, people like me think of little cute furry cats, romantics recite Rumi’s verses while others wonder about the Persian carpet that they need in order to make their room look beautiful. Even though home décor trends change often and in the most modern ways, a Persian carpet remains a stylish artefact with rare values that cannot be replaced. They are authentic pieces of handicrafts and buyers are more and more interested in having one of them, while private collectors and museums such as the Louvre in Paris search for antique ones to include in their precious collections. Everything mentioned above is part of the Iranian culture and when Iranians make a hand-knotted rug, they use motifs and designs that echoes all the elements of their art and culture. The head of Iran National Carpet Center, Hamid Karghar once said: “Iranians are born on carpets. When they die, they are covered by carpets. A carpet is part of their life”. This means that they put all their passion and knowledge in the creation of this element of Iranian art that is increasing and attracting the attention of people from all over the world. 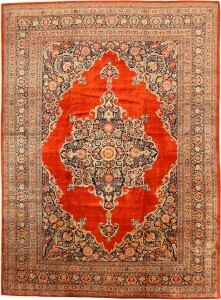 Persian rugs usually are divided into three groups. Anything greater than 6×4 feet is part of Farsh or ‘Qalii’ group, while carpets sized 6×4 feet and smaller are part of the Qalicheh group. The latter group includes nomadic carpets known as Kilim which means “rough carpet”. Wool is the most common material for rugs and cotton is frequently used as well as silk, but silk carpets are mostly used as wall art. Design is the element that distinguishes one carpet from others. 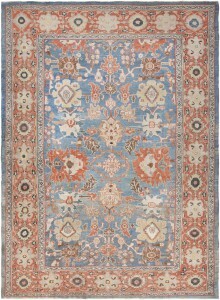 It takes few years to weave one single oriental rug. In the meantime, their names are related to designs, regions, tribes, villages and other specifics linked to the origin of the rug and its weaver. 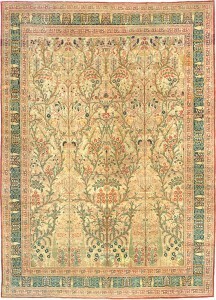 A carpet is like the chronicle history of the family of the weaver and their village. How does it feel to see a rug and imagine the hands of an entire family that have weaved every knot of that wonderful piece of art that hangs in the wall of your house? It can really be a magic carpet that tells more than what one can see in the red and gold arabesques, cloud bands, medallions, and overlapping geometric compartments. 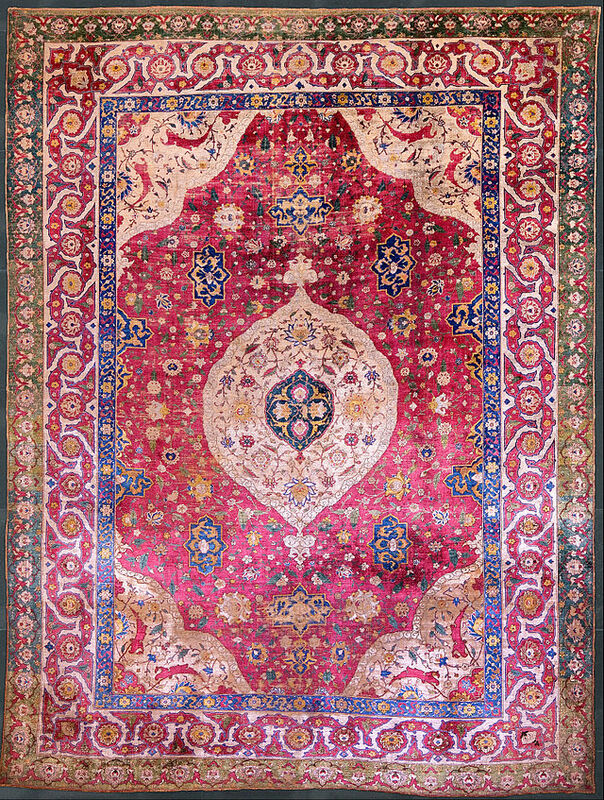 The history of Persian carpets dates back to 2,500 years ago. Iranians were and remain the perfect masters of carpet weaving and they handed down their skill from one generation to another. At first carpets were considered common articles of need used to cover the floor or to protect nomads from cold, but they were too beautiful and this is how they caught the eyes of rich people and rulers. 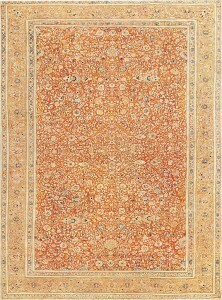 Since then, Oriental carpets were considered sign of esteem, status and prestige. This art experienced many changes during various periods of the history of Iran and every invasion came with several social changes but the carpet weavers improved their art and reached to excellent levels of hand-manufacturing. It has been difficult for archaeologists to find complete preserved carpets from the early periods, but however the oldest known “knotted” carpet that dates back to the fifth century before Christ is now part of the Hermitage Museum of Leningrad. There are many facts on some of the most famous rugs and their marvelous beauty, but it is sad to know that most of them were destroyed after invasions. They have been cut to pieces and distributed to the troops as booty. 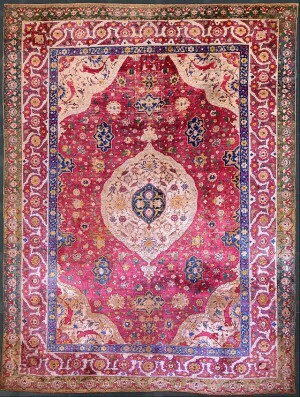 Currently, Iran’s carpet exports reached up to 57 million of dollars for the first quarter of 2014, while foreign companies from Europe or the US set up businesses in Iran in order to meet the needs of western countries. 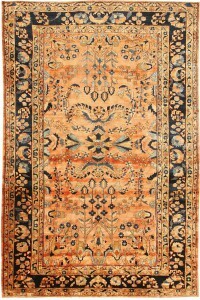 This introduced the machine-woven rugs that are similar to hand-woven carpets, but the price makes the difference. 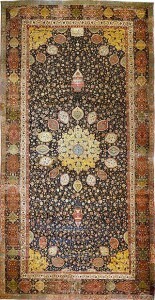 Over 1.2 million of Iranians work as weavers and produce rugs for export. 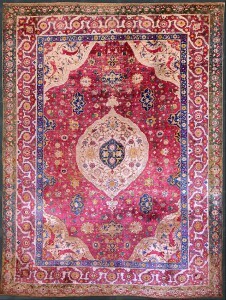 Nowadays, carpet weaving is the most prevalent handicraft in Iran. A hand-woven Persian carpet is a priceless possession and the fact that a rug from the early 17th century was sold for $33.7 million in New York in 2013 proves this. One of the most asked questions when it comes to the authenticity of Persian rug is how to know if they are hand-made or machine knotted. This is a simple thing. A hand-made rug has the same design in the back as the front of the rug and in most of cases the weavers sign the carpet and include their signature in the design such as the famous inscription in the famous ‘Ardabil carpet’. You cannot even try to resist the seduction of a world of colors reflected over an ancient Persian carpet.